Writers in the sphere of the beer Twitterverse have likely been keeping an eye on the following story since it broke yesterday, as Pete Coors, Big Beer industry figurehead and chairman of Molson Coors’ board of directors, laid into the Brewers Association via an open letter. In his letter, Coors excoriates the organization for a lack of friendliness and civility toward the 1-percenters of the beer world, bringing out the typical rhetoric that the craft beer industry and the makers of Bud, Miller and Coors brands should all be working together to take on a series of common threats—presented by Coors as the growing wine, spirits and cannabis industries, among others. He wasn’t wrong about the threats to the industry as a whole, as the statistics back him up, but it was still some classic Big Beer messaging: Insult opponent, accuse (tiny, independent) opponent of unfairness and bullying toward a global megacorp, and simultaneously tell opponent they should be supporting and working with you—for their own good—despite the fact that the craft segment of the market is still growing rather than shrinking, albeit not as fast as it once was. Coors even manages to imply that the craft beer industry’s mean attitude, rather than their superior beers, are somehow involved in his company’s difficulty selling more light lager than the previous year. Well, Nikos Ridge wasn’t about to take that message laying down. 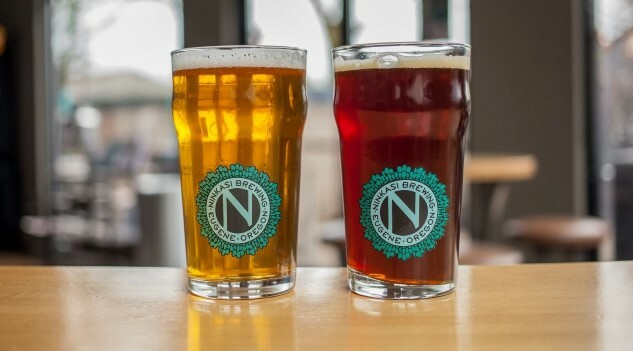 The President and co-founder of Eugene, OR’s Ninkasi Brewing Co., who recently made the rankings of our blind-tasting of 151 pale ales, went through Pete Coors’ letter line by line, serving up some comic rebuttals along the way. Presented below are some of our favorite exchanges, but you can read both letters right here. Pete Coors: The brewing industry is not exclusively made up of “large, multinational brewers” or “big brewers” or “faux craft brewers.” It is not exclusively made up of “mass produced” beer, craft brewers or home brewers. Rather, the beer industry is a combination of large and small brewers, retailers, distributors and suppliers who are passionate about their craft and committed to their businesses. And, they are passionate about competing for the millions of American consumers who love beer. Nikos Ridge: Correct. The problem arises when certain tiers within the industry (large multinational brewers), work to obscure the origins and manipulate the market to their advantage. By disguising beer brands as “craft” and using the market power and tactics available to huge organizations, you deliberately mislead customers and damage the industry. Pete Coors: You must know that it is insulting to those of us who don’t meet the clever criteria of your self-proclaimed definition of “craft brewer.” This approach prioritizes insults and division over unity for a beverage that has been used to unify and celebrate together for generations. Nikos Ridge: What’s insulting is for you to lie to craft beer customers about the origins of their beer and then argue that it’s a problem when we [craft brewers] point it out. Why don’t you call it “MillerCoors Hop Valley?” Because you know what you purchased is the ability to lie to customers and to cash in on craft credibility. If you didn’t, then how about you claim it, with the pride you seem to have for what you’re doing? I think we’re aware of the reasons why you don’t, and in fact, you go to great lengths to cover it up. Pete Coors: That is a slippery slope that does not end well for our industry. We have enough competition inside the beer business and outside it with wine, spirits and, increasingly, marijuana. Nikos Ridge: I might say that we have more in common with small producers across industries than with the vertical players in our own industry. Craft brewers face similar access to market issues, high costs and challenging incumbents. Our only chance is to come up with innovative, exciting beers for customers who care enough to support what we do. More marijuana, craft distiller, small winery, and craft beer collaborations down the road perhaps? Pete Coors: You undermine your credibility by pitting us against one another to the ultimate detriment of the entire beer industry. Nikos Ridge: Look at the top Faux Craft brands, declining and dragging down the industry as a whole. Who is winning? It’s still the independent, regional, and, in particular, new and local craft brewers, hitting the market with exceptional products, customer engagement and exciting stories. What undermines our collective credibility is when large brewers lie about origins, trick and confuse customers, while legislating against other tiers of the industry, and creating global mega-mergers that drive down choice and increase monopoly power. Quite the imbroglio, but it’s difficult to not cheer at least a little for Ridge and Ninkasi at the end. Not everything that Pete Coors says in his letter is flawed—the beer industry really is facing a difficult economic climate unlike anything it has faced in recent memory—but to ignore the role his own company’s lobbyists have played in pitching legislation against small craft brewers is simply inviting this kind of response from the likes of Nikos Ridge. There’s no way you can, in Coors’ position, fire off a letter like this to the Brewers Association and logically expect any other kind of outcome. To think otherwise is the height of delusion. Even in a world where we’ve already written about how the word “craft” has become outdated and less useful, it’s clear who holds the philosophical high ground. And it’s not the guy dependent upon customers erroneously thinking that Blue Moon is a “craft beer,” believe it or not.